On every level -- writing, direction, acting -- Double Indemnity (1944) is a triumph and stands as one of the greatest achievements in Billy Wilder's career. Adapted from the James M. Cain novel by director Wilder and novelist Raymond Chandler, it tells the story of an insurance salesman, played by Fred MacMurray, who is lured into a murder-for-insurance plot by Barbara Stanwyck, in an archetypal femme fatale role. From its grim story to its dark, atmospheric lighting, Double Indemnity is a definitive example of World War II-era film noir. Wilder's approach is everywhere evident: in the brutal cynicism the film displays, the moral complexity, and in the empathy we feel for the killers. The film received almost unanimous critical success, garnering seven Academy Award nominations. More than fifty years later, most critics agree that this classic is one of the best films of all time. The collaboration between Wilder and Raymond Chandler produced a masterful script and some of the most memorable dialogue ever spoken in a movie. 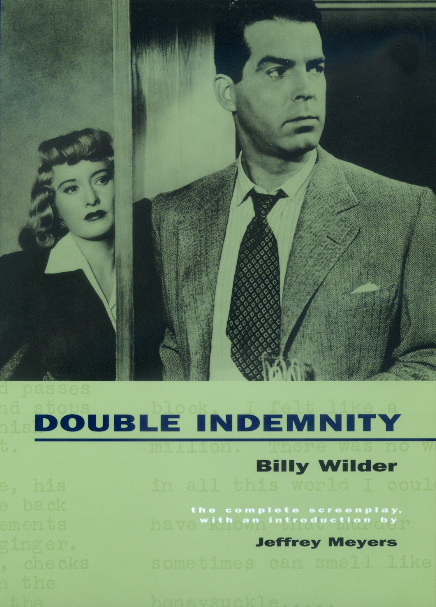 This facsimile edition of Double Indemnity contains Wilder and Chandler's original -- and quite different -- ending, published here for the first time. Jeffrey Meyers's introduction contextualizes the screenplay, providing hilarious anecdotes about the turbulent collaboration, as well as background information about Wilder and the film's casting and production. Billy Wilder has been nominated for twenty-one Academy Awards and has won six Oscars. Jeffrey Meyers has written many books and articles on modern American, English, and European literature.